These surface month wall boxes have rectangular cutouts for mounting Keystone style connectors. These Surface Mount Boxes can hold up to two of the keystone inserts and securely mount to any walls with the adhesive tape. 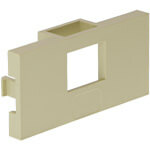 This Keystone Insert connects into our surface mount boxes and houses one compatible keystone jack. 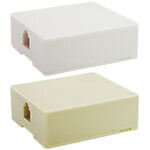 Compatible with our surface mount boxes, these inserts can house two keystone jacks and easily snap into the boxes. 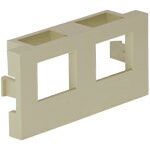 With up to 4 inserts for compatible keystone jacks, this Surface Mount Kit mounts flush against flat surfaces or walls. 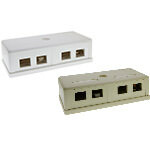 These 1-Port Keystone Surface Mount Boxes neatly house one keystone jack and easily mount to most flat surface areas. 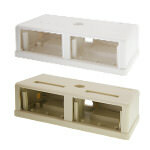 This 2-Port Surface Mount Box has the ability to house two keystone jacks and can be fastened to most flat surfaces. 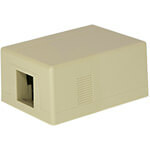 The 1-Port Surface Mount Box houses any RJ11 telephone cords and comes with adhesive tape for mounting. 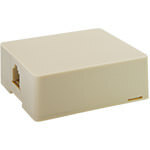 Including a 2-Port housing for RJ11 jacks, this Surface Mount Box fits up against walls and comes in a nice beige finish. 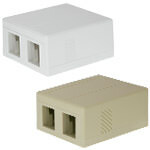 The 1-Port RJ12 Surface Mount Box helps add a voice port to any flat surface and works with the RJ12 jack. 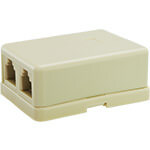 Great for any networking applications, this 1-Port RJ45 Surface Mount Box will mount quickly onto flat surfaces.